In reality, three-hundred-sixty-five days a year is Mother’s Day. No sick days. No lazy Sundays. No Netflix and Chill days. 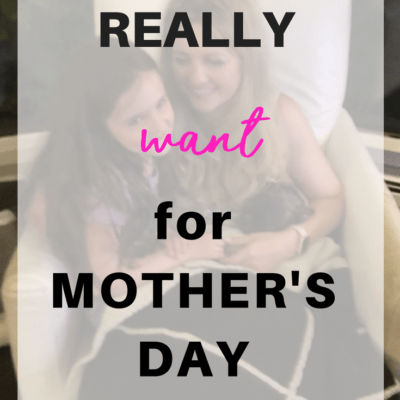 I don’t want Mother’s Day. I want a Mental Health Day. It is the morning of Mother’s Day. I am still sleeping. No one crawled into my bed last night. No one screamed at 3 a.m. because she heard a bug in her room. Uninterrupted sleep at its best. Quietly, my family tiptoes throughout the house. My husband takes the kids out for a while. Unbeknownst to me, my daughter’s hair is brushed, her teeth are clean, and she has matching socks. My son successfully locates his shoes on his own. Someone remembers to feed and walk the dog. In our quiet house, I sleep until I get to my “I can’t believe I slept this late” moment. Ladies, I know, I know that our children have completely messed with our sleep clocks so that we wake with the birds no matter what. You digress . . .